United Airlines celebrated the 40th anniversary of its service between Guam and Japan with a water canon salute and a Hafa Adai gate ceremony on Oct. 1 at the A.B. Won Pat International Airport, Guam. United, Guam Visitors Bureau and Miss Earth Guam 2017 Emma Sheedy and Miss World Guam 2017 Destiny Cruz greeted passengers on UA Flight 827 from Tokyo at the gate with leis and hosted a reception for passengers in the arrivals terminal. 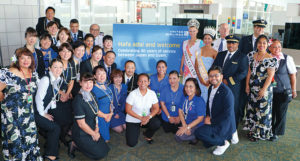 The Guam sales and operations teams of United Airlines, crews of UA Flight 827 and UA Flight 873, the Guam Visitors Bureau, Miss Earth Guam 2017 Emma Sheedy and Miss World Guam 2017 Destiny Cruz celebrated 40 years of service between Guam and Japan on Oct. 1 at the A.B. Won Pat International Airport, Guam.